Testifying before the Armed Services Committee, military leaders resisted a call to change how victims of sexual assault report the attacks. It was a battle on the Hill Tuesday as top military leaders agreed on the need to do more to prevent sexual assaults—but fiercely resisted calls from U.S. senators on the Armed Services Committee to remove the handling of such cases from the chain of command. The hearing comes on the heels of multiple bills from senators and representatives seeking to address the rising number of sexual assaults in the military. Several of the bills call for such cases to be dealt with by outside officers to make it easier for victims to report attacks. 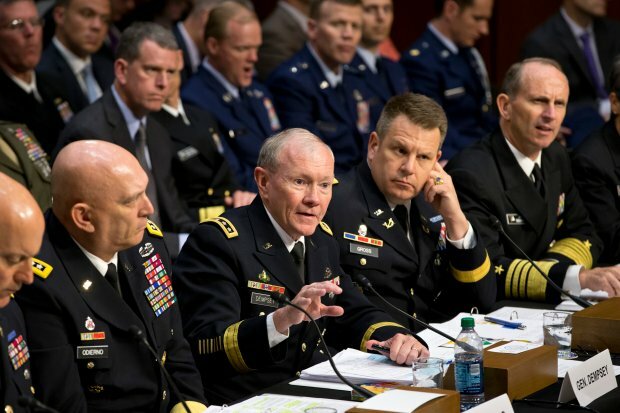 But at Tuesday’s hearing, military leaders pushed back, with most arguing that sexual assault is better dealt with, in the current system, with the victim’s commander as a key part of the process. Air Force Chief of Staff Gen. Mark Welsh III—who came under fire during last month’s hearing for blaming sexual assaults on the “hook-up culture”—said there was no other option but to include a commanding officer in the process of filing a sexual assault complaint. “Commanders shouldn’t just be part of the solution, they must be part of the solution, or there will be no solution, that’s how our systems operate,” he said. Across the aisle, Sen. Kirsten Gillibrand (D-NY) passionately disagreed with the assertions from the panelists. Gillibrand introduced one of the Senate bill’s that would allow victims of sexual assault to report their cases to an outside military official. Lawmakers’ proposals stem from the idea that women and men in the armed forces may not be reporting their attacks because of fear of reprimand, often by their commanders. Witnesses at a past Senate hearing testified (PDF) that commanders frequently advised them not to report assaults, and that in some instances the in their chain of command, who they were bound to report an assault to, was in fact the very person who had assaulted them. According to a Pentagon report released this month, there were 26,000 instances of sexual assault in the military in 2012—but only 3,374 cases were reported. The reason they do not report these crimes is because they fear retaliation. The annual report came after a series of high-profile stories about sexual misconduct in the military. In May alone, reports emerged of an alleged prostitution ring at Ford Hood run by an officer charged with sexual assault prevention; the arrest of Jeffrey Krusinski, head of the Air force’s Sexual Assault Unit, for sexual assault; a secret taping of female cadets in showers at the U.S. Military Academy at West Point by commanders, and the investigation of three Naval Academy football players for sexual assault. “All of these scandals that have surfaced makes me wonder if the initiatives currently in place will do enough and whether it’s not good to take a more significant look at how we operate in the military and to really address this scandal at all levels,” said Sen. Jeanne Shaheen (D-NH.) on the purpose of the proposed legislation. Sen. Claire McCaskill (D-MO) took issue with how military representatives suggested the assault issue could be dealt with by changing the military climate, saying there was a difference between inappropriate sexual comments and sexual predators. McCaskill introduced a bill that would eliminate a military officer’s ability to overturn a verdict after a trial ends, as has happened twice in the least year. At the hearing, she questioned how military commanders decided to bring a case to court-martial and argued that a person accused of a sexual crime should not be allowed to have their character traits like “whether they are a good pilot or not” taken into consideration when commanders decide whether to file charges. Sen. John McCain (R-Ariz.), who previously served in the Navy, said the increasing numbers of sexual assault cases seen today worries him about the armed forces’ future.